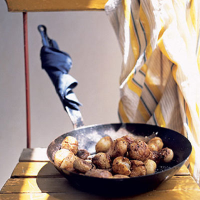 A simple but delicious way of serving new potatoes, this dish is a fantastic accompaniment to almost anything. We use coriander seeds from our allotment once the plant has gone to seed. Allow the potatoes to cool slightly before serving. Lightly crush the coriander seeds with a pestle and mortar. Crack the potatoes slightly with a heavy rolling pin or mallet in a polythene bag. Season with salt and let them stand for 5 minutes – no longer or they will darken in colour. Place a large saucepan over a medium heat and add enough olive oil to cover the bottom of the pan. Add the coriander seeds and potatoes and stir. Cover with a tight-fitting lid and turn the heat to low. Cook the potatoes for around 25–30 minutes until tender, giving the pan a good shake every 5 minutes. Remove from the heat, pour over the red wine and grind over a little black pepper. Shake well again and cook uncovered for a further 2 minutes while the wine evaporates. Check for seasoning before serving.